Acknowledged author R. Freyermuth wrote Cases and Materials on Real Estate Transfer, Finance, and Development (American Casebook Series) comprising 1501 pages back in 2015. Textbook and etextbook are published under ISBN 0314288600 and 9780314288608. 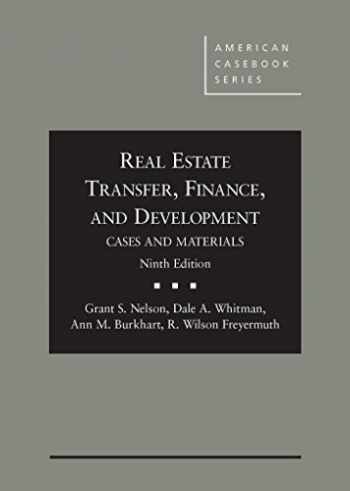 Since then Cases and Materials on Real Estate Transfer, Finance, and Development (American Casebook Series) textbook received total rating of 4 stars and was available to sell back to BooksRun online for the top buyback price of $80.84 or rent at the marketplace. The Ninth Edition of this popular casebook retains the basic organization and coverage of its predecessors, but comprehensively addresses the tremendous changes that have occurred in the past five years in real estate finance and in the real estate industry. The Ninth Edition includes: a thorough updating and revision of the material on foreclosure, including material on loss mitigation, short sales, loan modification programs, pre-foreclosure mediation requirements, and foreclosure-related litigation; a comprehensive revision of the material on securitization and the ownership, transfer, and enforcement of securitized mortgage loans, including detailed treatment of the proper application of Uniform Commercial Code Articles 3 and 9 to the ownership, transfer, and enforcement of mortgage notes and the litigation involving the Mortgage Electronic Registration System (MERS); a comprehensive revision of the chapter on governmental intervention in the mortgage market, including thorough treatment of the FHFA’s conservatorship for Fannie Mae and Freddie Mac, Dodd-Frank, and the new Consumer Financial Protection Bureau; a functional restructuring of the material on bankruptcy law and its impact on mortgagees in Chapters 7, 11, 12 and 13.